Last member of 65,000-year-old tribe dies, taking one of world's earliest languages to the grave. The last member of a 65,000-year-old tribe has died, taking one of the world's earliest languages to the grave. Boa Sr, who died last week aged about 85, was the last native of the Andaman Islands who was fluent in Bo. Named after the tribe, Bo is one of the 10 Great Andamanese languages, which are thought to date back to the pre-Neolithic period when the earliest humans walked out of Africa. Boa was the oldest member of the Great Andamanese, a group of tribes that are the the first descendants of early humans who migrated from Africa about 70,000 years ago and who arrived on the islands around 65,000. Other groups went on to colonise Indonesia and Australia. She lived through the horrors and hardships of the 2004 Asian tsunami, the Japanese occupation and diseases brought by colonisers in the 19th century. Boa described the moment the tsunami struck: 'We were all there when the earthquake came. 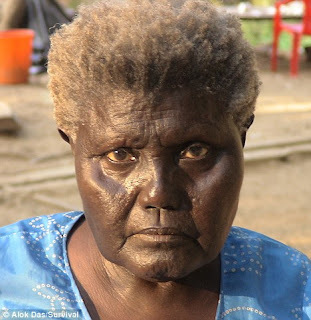 Professor Anvita Abbi, a linguist who knew Boa, said the tribeswoman had been losing her sight in recent years and was unable to speak with anyone in her own language. Boa had no children and her husband died several years ago. 'Since she was the only speaker of Bo, she was very lonely as she had no one to converse with,' Professor Abbi told the Times. Professor Abbi managed to speak with Boa using a local version of Hindi and Great Andamanese, which is a mixture of all ten tribal languages. 'We had an odd relationship, but also a very intense one,' the professor said. Boa was born in the jungle of the northern Andamans and grew up in traditional society, learning to gather wild potatoes and hunt for wild pigs, turtles and fish. 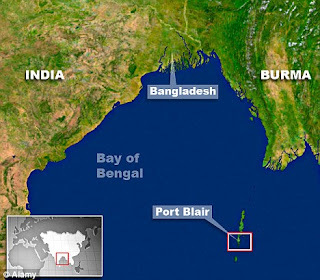 In 1970, the Indian Government moved the Great Andamanese tribes to the tiny Strait Island near Port Blair. Boa lived in a concrete and tin hut provided by the government and survived on state food rations and a pension of about 500 rupees (£6.80) a month. 'She always said she wanted to go back to the place where she was born,' Professor Abbi said. The Bo are believed to have lived on the islands for as long as 65,000 years, making them one of the oldest surviving human cultures. The king of the Bo tribe died in 2005, leaving only a handful of elderly members who also died over the next five years. The Great Andamanese once numbered more than 5,000 and were made up of 10 distinct groups each with their own language. But today, after more than 150 years of contact with colonisers and the diseases they brought with them, the Great Andamanese number just 52. 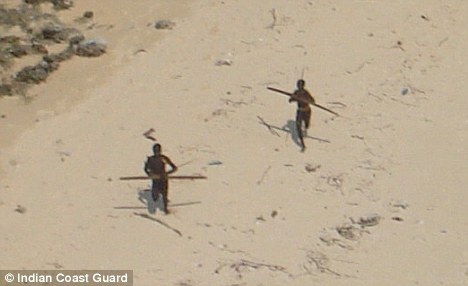 The only indigenous tribe that is relatively intact is the Sentinelese, who ban any contact with outsiders. They were famously photographed firing arrows at an Indian helicopter after the Boxing Day tsunami in 2004. Professor Abbi said that Boa often told her how she envied the fact that the Jarawa and the Sentinelese had managed to avoid contact with outsiders. Stephen Corry, director of Survival International, a group that campaigns for the rights of indigenous people, urged the Indian Government not to resettle any the Jawara or other indigenous tribes. 'With the death of Boa Sr and the extinction of the Bo language, a unique part of human society is now just a memory,' he said.